Smallest snipe in region. 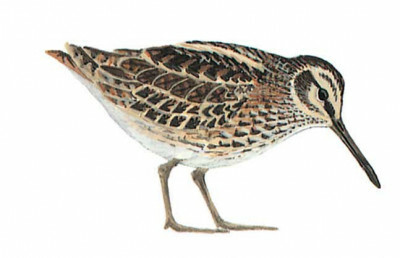 Very hard to see on ground being superbly camouflaged and extremely difficult to flush; often rises silently at about 1 m distance, in low, slightly jerking flight, which is less powerful than Common Snipe’s and reminiscent of a small crake; settles almost immediately; short bill, blackish brown upperparts with two broad contrasting yellow lines and short pointed tail are distinctive features. If seen on ground also note: green-glossed back, absence of central crown-stripe, dark-striped flanks (not barred). Separated from other snipes by size and short bill. Usually solitary.